What is your climate zone? This tree only has a limited range. Are there others in the area that are flowering as they should? 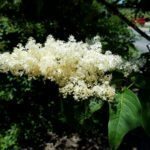 If this tree is in the correct climate, and the soil has been amended and tested to be healthy and fertile, then it could be that the tree is, simply, not old enough to flower properly yet. If the soil is questionable, then I would say that there is too much nitrogen, or a lack of phosphorus and potassium. Adding phosphorus and potassium would correct this issue.